This is one of Colorado’s most impressive state parks, and it’s just outside of the popular college town of Boulder. Eldorado Canyon State Park boasts beautiful canyon scenery in a convenient location, but what it’s best known for is its rock climbing options. 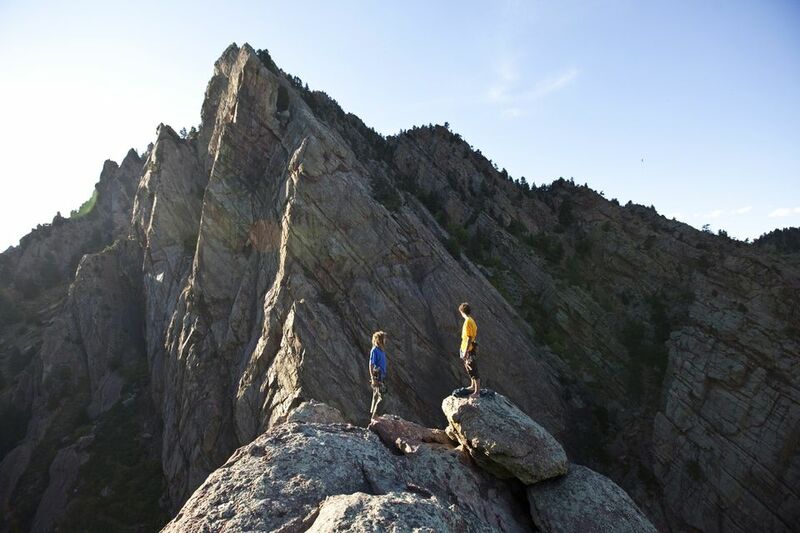 Eldorado Canyon, Eldo for short, is considered one of the best places in Colorado to climb. In fact, it boasts over 500 (and some say upwards of 1,000) different technical climbing routes. If you enjoy climbing, Eldo is a bucket-list item. But even if you don’t climb, there’s still plenty for you to enjoy here, such as picnics by the stream and hiking trails with dramatic views. Here’s everything you need to know to get the most out of a visit to Eldorado Canyon State Park. Elevation: Different trails have different elevations, but you can typically expect between 6,000-7,000 feet above sea level. This is much higher than the 5,280-foot elevation in Denver so it may require some acclimation. Cost: To enter, it's $10 per person per day. The park is only open during the daytime, and you have to leave before the sun sets. Location: The park is west of Boulder and west of Eldorado Springs on Colo. 170. The state park is surrounded by Roosevelt National Forest to the west and mountains of the Front Range. To the east is Boulder and then Denver. It’s easy to get to Eldorado Canyon. From Boulder, take Broadway to Colo. 170. Then head west on Colo. 170. Take that for three miles through the town of Eldorado Springs. When you enter the state park, you will have to drive on a dirt road for about a mile through the canyon. You will cross a small bridge, too, but conditions are not extreme. Follow the signs to the visitor center. The drive will take about 40 minutes from Denver and less than 20 minutes from Boulder. Facilities: No overnight camping is allowed in the park. There is a handicap-accessible visitor center with water and restrooms. There are also restrooms near Supremacy Rock, as well as designated picnic sites available on a first come, first served basis. You can use grills or cookstoves in the picnic areas. Tip for Visitors: The convenience of this park is also its downfall. It can get packed. If you can avoid visiting Eldorado Canyon during the peak season (May through September on weekends), you'll avoid some of the crowds. The parking lot quickly reaches capacity during this time, and staff won't let you in; it's a one-out, one-in situation. Instead, visit in the springtime or on weekdays, and arrive early to avoid the congestion. This state park has a rich history. The rocks themselves date way back, as far as 1.5 billion years. The earliest signs of communities here connect back to be the Ute Indians, who built their homes in the walls of the canyon for protection from Colorado’s weather. The weather here can get pretty frigid, especially in the wintertime, when snow is common and trails may even be lined with ice. As with a typical Colorado mountain destination, weather can change quickly within the day, and it’s common to have afternoon storms. Later, other settlers moved into the area, looking for gold and a place for agriculture. Around the 1900s, Eldorado Springs was turned into a luxury resort community that even drew celebrities. But that was short-lived after a fire took down several of the hotels. The 885-acre Eldorado Canyon State Park has two different areas. The Inner Canyon is the more developed area, and Crescent Meadows is undeveloped. Here are some of the many varying ways to enjoy Eldorado Canyon State Park. Rock climbing: This is the most popular reason people visit Eldo. Find climbing routes for different levels, although it is generally considered a challenging spot to conquer. You will only find a few bolted "sport routes" in the canyon, and some of the cliffs jut up as high as 700 feet. The canyon is known for its multi-pitch sandstone walls, intricate routes, irregular cracks, and more. Best to leave this to the climbers with experience, or book your climb through a tour company that can keep you safe. Wildlife: Keep your eyes (and camera) ready for wildlife, even the big guys: black bears and mountain lions. Horseback riding: You can go horseback riding on some of the trails here. Pick up a map at the visitor office to make sure you follow all rules. Mountain biking: You can also bring your mountain bike on Eldo’s trails. Hot springs: Take a dip in the nearby deep-blue hot springs pool, the closest hot springs to Boulder. The natural, artesian-spring-fed pool isn’t too hot, around 76 to 80 degrees, which makes it more appealing to families for a dip on a hot summer day. This hot springs has been operating since 1905. Picnicking: Pack a lunch and spread out the blanket on South Boulder Creek for a scenic picnic. Check the map for designated picnic spots, which are available first come, first serve. Fishing: You can fish in the creek if you have a fishing license. Winter activities: In the winter, it’s common to go snowshoeing or cross-country skiing here. Even if you don’t climb, there are great trails you can hike. Eldorado Canyon State Park offers about 11 miles of trails of all levels, from easy to challenging and short to long. Some trails connect to the city of Boulder's trail system, providing a full day's worth of hiking entertainment and challenge. Fowler Trail is an easy trail (partially wheelchair accessible) with great views and people-watching if you like to watch the daring rock-climbers do their thing. Pick up a self-guided nature walk brochure in the visitor center. Follow the interpretive nature signs throughout the 0.7-mile (one way) trail. This is trail great for families. Rattlesnake Gulch Trail is a little harder and longer. It’s considered moderately difficult and travels 1.4 miles each way to one of the best historical sites in Eldorado Canyon State Park: the old Crag Hotel. This hotel, built in 1908, only ran for a few years (it burned down in 1912) but was considered a luxury destination for people in the turn of the century. It was accessible via an inclined railway from the canyon floor. Follow the trail past the ruins for about 0.8 miles, about 1,200 feet above the trailhead, to end at the Continental Divide Overlook, where you can see the point in North America where water flows in two different directions.